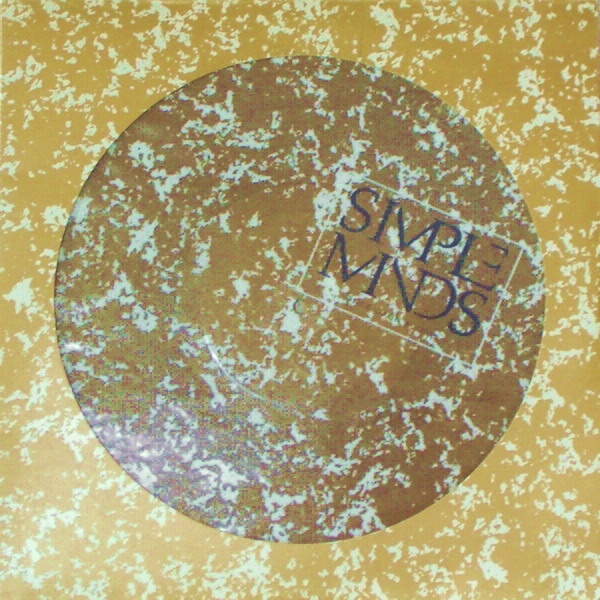 When Simple Minds followed a dramatically different tangent on their follow up to the breakthrough “New Gold Dream” album, designer followed along, albeit with one foot in the past. The imagery still drew from antiquity with heraldic imagery used in lieu of the more typical band shot. And there was still a five color sleeve with metallic gold inks, but the images were rendered with a clean, modern touch that was best reflected by the use of a fluorescent orange ink [that does not transmit its vibrance online] as one of the basic colors. 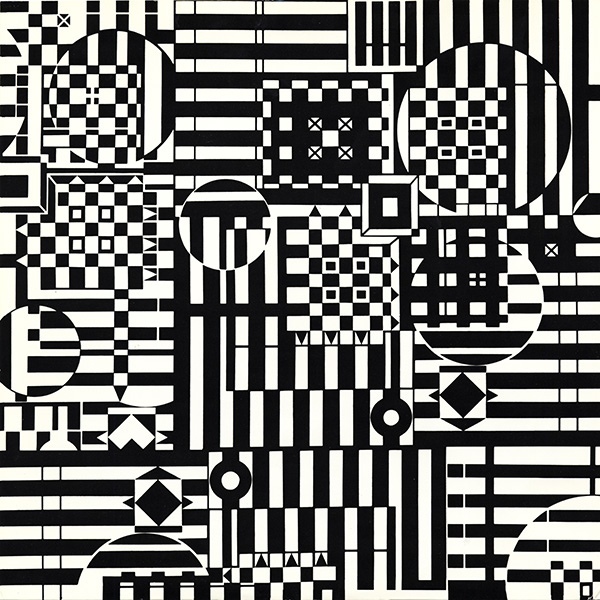 The inner sleeve delved deeper into the op art that the back cover hinted at with negative areas in the grid contained within circular holds. The UK labels also picked up on this motif for a custom look that trumped the generic A+M labels used on the US copy that was on my racks. 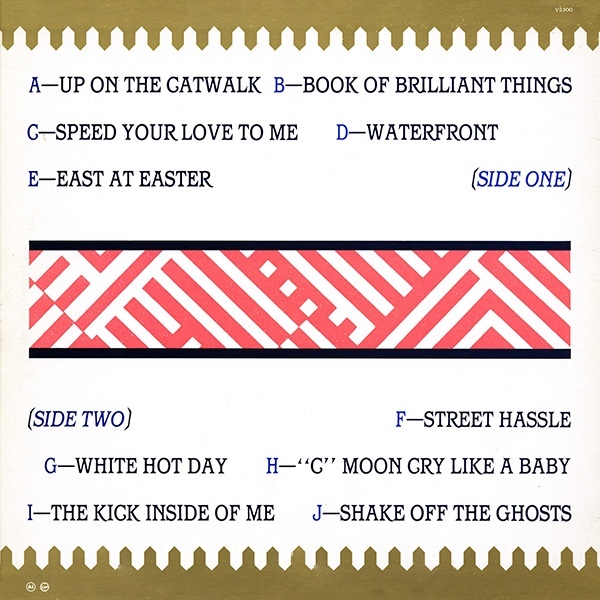 The front cover design never quite worked for me as it didn’t really reflect the music inside of it as well as the earlier covers had done, but the op art imagery was more successful in this regard. 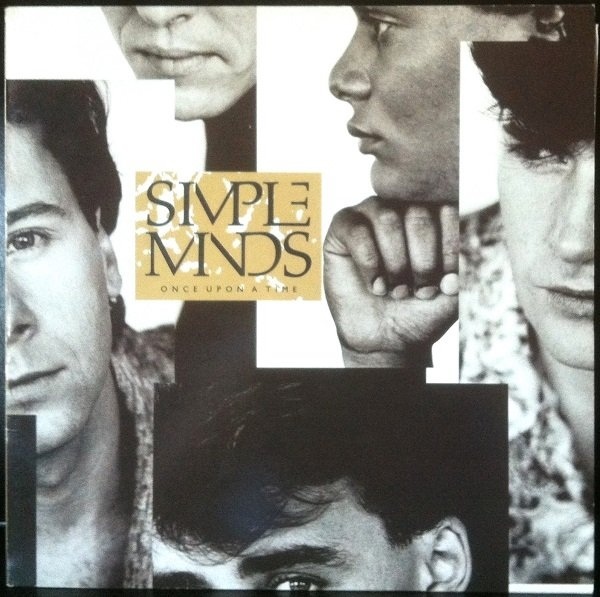 Simple Minds had followed an album of subtle tonal range with one of high contrast, so this made sense to me. The cover imagery touches on this, but seems to be holding back as mentioned by once again referring to historical imagery. I think that the back cover comes closer to more accurately representing the music. Only the edge trim in gold sends a false note. As I mentioned, I never owned a UK LP of this title. By that time, A+M Records were working that action, and I never saw imports of titles that also got a domestic release unless they were issued abroad far in excess of the release schedule at home [cf. Altered Images “Pinky Blue”]. I went from the A+M LP to the A+M CD two years later, and there I sat, until in 2001, a trip to Toronto yielded this gem. I was aware that the Canadian copy of this album had its first pressing issued on clear vinyl back in the day, but then I saw this in the bins, I had to give a look and viola, there it was, albeit without the sticker on the cover. I chortled at my luck that saw this added to my haul that weekend for a pittance. Only records of use to hip hop sampling [ca. 2001, jazz and lounge records] were selling for big money in that environment at the time. As was common with many Virgin territorial labels, this featured the familiar red/green label variant of the day. I’ve yet to actually own a UK pressing of this album in any format, but that super deluxe boxed set was released last month and is still calling my name. 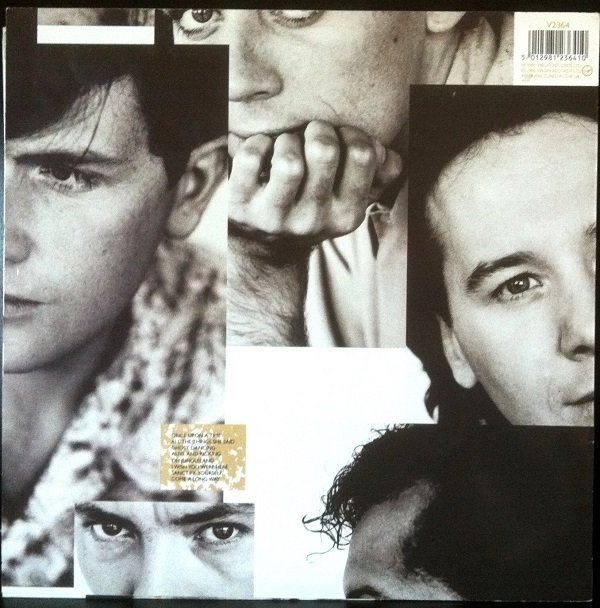 I’ve recently read Jim Kerr talking about the notion behind their top selling “Once Upon A Time” album as a result of seeing what David Bowie had done when recording in America and aiming for the pop charts instead of arty obscurity. Seen in this light, the decision to use Mick Haggerty for the cover art [Anton Corbijn took the photographs] makes all the sense in the world. Especially given that Haggerty had a strong relationship with their American label, A+M Records and had in fact, designed the cover to “Let’s Dance,” not to mention top selling discs by Supertramp and The Police. Even I have to admit that the “Breakfast In America” project was a graphic design tour de force; fully worthy of its many accolades. We’ll not see its like again. Chances were not being taken here at any level, so the steadfast Malcolm Garrett was ejected for this time only [he’d return soon enough] and the resulting album cover for once featured the band bold as brass on its cover; albeit with an arty edge still [barely] remaining. As if to give no doubt as to where the loyalties of this album lay, the covers [front and back] were designed to be a seamless tile; all the better for covering the wall or front window of a record store! NOTE: Please don’t try this at home! 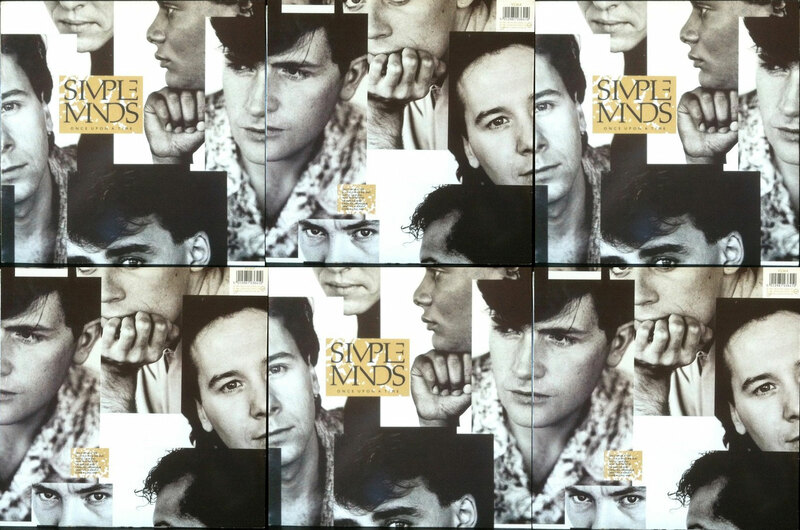 Is it me or does Jim Kerr look hypnotized on the cover shot? He was probably dreaming of the filthy lucre that lay ahead and would be filling his coffers soon enough. As if to hammer home the banality of this album, the most exotic variation available was the UK picture disc LP; possibly the least interesting pic disc I’ve ever seen. I’ve seen this in stores back in the day and I was not touching that with a ten foot barge pole. Next: …[if you can believe it] Still More Covers! 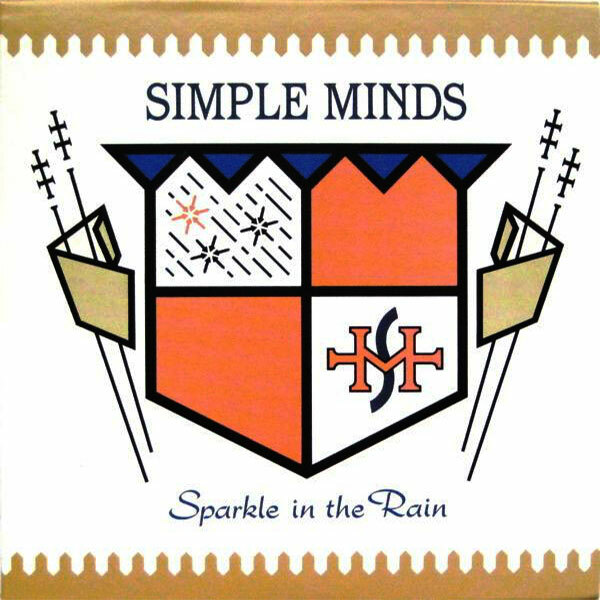 This entry was posted in Core Collection, Scots Rock and tagged 1984, Assorted Images, Malcolm Garrett, Mick Haggerty, Simple Minds. Bookmark the permalink. Nick – I’m aware of the UK white vinyl, but decent images of that online are sadly missing. If I were an emoticon type, I suppose I’d put one here… but I’m not! If you ever see emoticons on PPM you’ll know I’ve been replaced with a clever imposter! I’m not only awaiting the replacement disc for the boxed set but also for the cash to buy it to fall out of the sky! Interesting reading and the contrast between 1984 and 1985 albums is really not only apparent, but quite shocking. A bit like a different band, really. What do you think of the clear vinyl pressings in general? Are they really the better-sounding ones like I’ve read several times from various sources? Should I fork out for them instead of good old black vinyl editions? 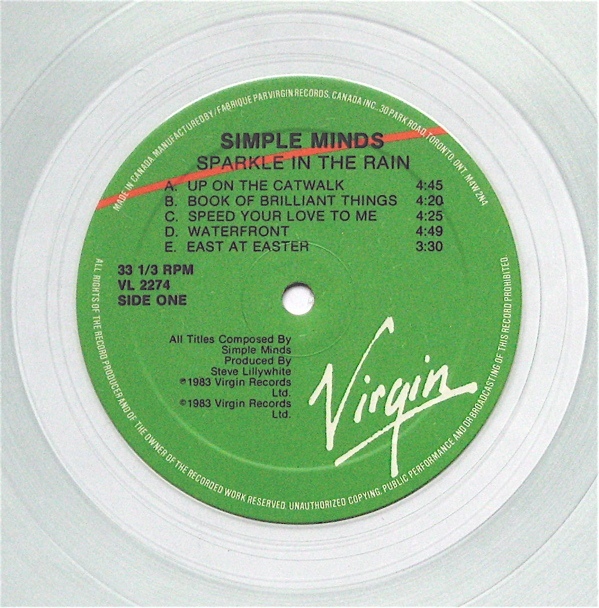 Vlad – In theory – clear vinyl should be always preferable, because it is virgin vinyl by its very nature. Virgin vinyl has been synthesized once and is not made from recycled PVC. Most record company output in the 70s and 80s when all I bought was vinyl was from reused stock. Unsold records melted down and returned to their molten state; along with any impurities that hitched a ride along the way. Vinyl quality was tanking at that moment in time, apart from the few labels who cared. What made a record sound great was the use of virgin vinyl, and it could be different colors or even [nominally] black. I will say that A+M Records pressings of the early to mid 80s used virgin vinyl expansively. Those pressings were marvelous with traits like increased dynamic range and reduced surface noise! Virgin vinyl was translucent. I bought records and held them up to the light to determine the quality of their vinyl. Virgin records could be dark purple or dark amber and they were head and shoulders above the garden variety of most vinyl. 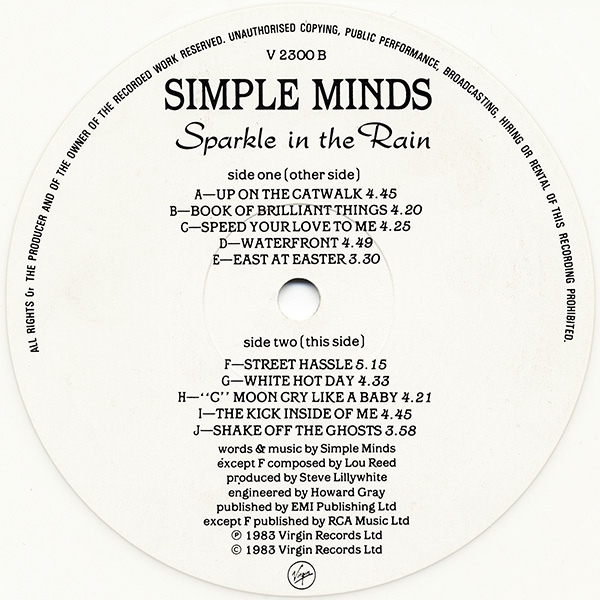 Of course the half-speed mastered records [that were costly] used virgin vinyl. To me the quality of the vinyl, not the mere thickness of the pressing is what separates quality from run-of-the-mill. The modern 180G pressings I have now still don’t hold a candle to the virgin vinyl discs that I have of 30 years age. 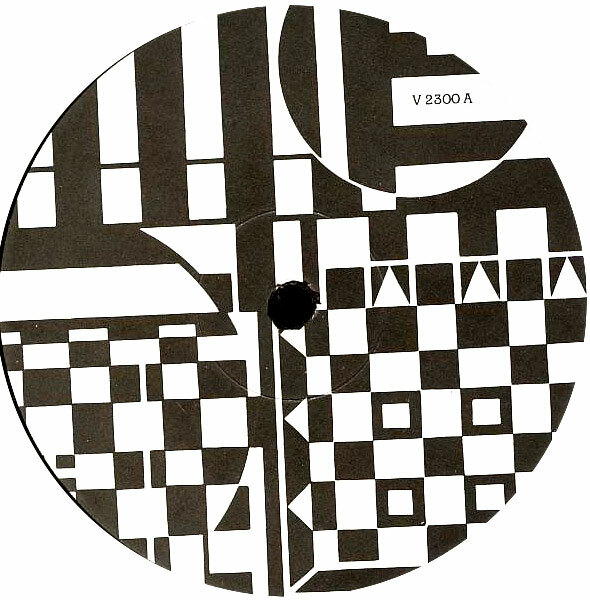 Some black vinyl discs that were pressed in the last two years that I have played are terrible! I’ve not had any recent clear or colored vinyl pressings to try. Given my interests, I have to say that modern vinyl is not even on my radar; except when it is the only way to buy music. What I’ve read about colored vinyl today suggests that it is no longer a cut and dried choice. This story on the running of a pressing plant handling lots of the current demand is eye opening reading. Comments on that post suggest that much of today’s pressings are wanting in quality for various reasons. When the industry is relying on dilapidated, 50+ year old machinery held together with chewing gum and prayer to keep production running, I wonder if it’s worth it. To my knowledge, there are no modern pressing plants using machinery manufactured within the last 25 years, much less what might be possible with modern technology. The vinyl resurgence has caught everyone by surprise, but it is not yet at a point where big capital is ready to invest in the R+D necessary to make 21st century record production facilities. But my thought is, that when or if this becomes possible, it could transform vinyl production. That said, I still consider vinyl an outmoded step, and prefer not to deal with it any further in my life. Then my big worry, is that we’ll lose digital disc manufacturing plants! Sony already closed their New Jersey plant in 2010 due to declining demand for CDs and DVDs. My fear is the complete phaseout of my preferred physical digital carrier formats as the world moves inexorably to cloud delivery that is rented, but never owned. The whole “rental culture” paradigm troubles me. At every level. 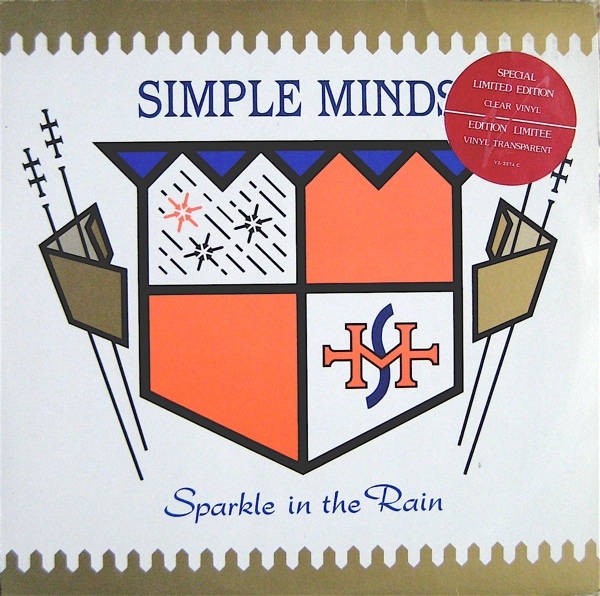 As for Simple Minds, yes. A different band indeed. A picture is worth a thousand words.